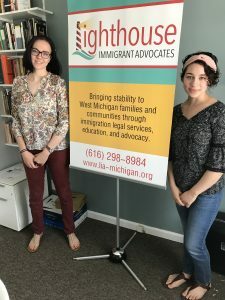 Inside the humble offices of Lighthouse Immigration Advocates (LIA) on Holland’s northside, Julia Fulton ‘19 and Vania Macias ’19 have engaged in a summer’s worth of meaningful work that will have a lifetime worth of profound impact. And not just for their own sake either, but for the sake of dozens of others they just met. That’s the way it should be, they’re quick to point out. Working for LIA during the summer of 2018 was never about Fulton or Macias anyway. LIA is a non-profit organization with a mission to bring stability and low cost legal services to immigrant families in Ottawa county. For Fulton, from Colton, N.Y., and Macias, a Holland-native, their summer commitment has always been about advocating for those on the margins — those seeking answers and advice in a new country and community. At times, the work has not been easy. It has, though, always been fulfilling and necessary for both women who are driven by their innate desire to serve others while putting their Hope education into action. Now, a panel discussion at Hope sponsored by the college’s Center for Diversity and Inclusion, Hope Church RCA and LIA has Fulton and Macias excited to see the issue they’ve been working on all summer brought into further light at Hope. “Advocacy: Action vs. Apathy,” will explore how families are being impacted by the nation’s immigration laws, policies and practices. It is the first event in a series of presentations planned for this fall about advocacy. This is not new territory for Fulton or Macias. Fulton, a French and political science major, helped organize an award-winning DACA March at Hope last fall, and she worked for CAIR (Capitol Area Immigrant Rights) Coalition in Washington D.C. while on Hope’s Washington Honors Semester last spring. Macias, a sociology major with a criminal justice emphasis, has been involved in CASA, Hope’s Children’s After-School Achievement program, as well as with Spanish-speaking churches in her hometown. Every previous opportunity provided by Hope, or sought out and obtained on their own, naturally led Fulton and Macias to their work at LIA. “This place just fit my beliefs. It fits the kind of community involvement I wanted to do,” says Macias, who is the office administrator for LIA. Besides feet-on-the-ground, hands-on experiences, Macias and Fulton connect their Hope education to their work with LIA. Macias points to her “Theoretical Perspectives in Sociology” class with Dr. Aaron Franzen as the course that best helped her understand the theories behind “otherness” and marginalization. It was so impactful that she created a research presentation detailing refugee displacement and alienation, along with methods that people employ to either renounce or encourage marginality practices. Macias was selected to present the resulting project, “Surviving in a World of Others,” at the North Central Sociological Association conference in Pittsburgh in April, 2018. Now as they enter their senior years at Hope, the two civic-minded students want to see others in their campus community become more aware and involved in issues that concern them, too. While the panel discussion on advocacy is a start, they know immense growth comes from partnerships they’ve had at Hope and in Holland. Encouraging others to experience similar relationships can only enhance their Hope careers, they say. And then perhaps, it can help them give back too. “Advocacy: Action vs. Apathy” will be held at 2:00 pm in the Martha Miller Center’s Fried-Hemenway Auditorium. The public is invited to attend.